"When I was thirteen, my mother actually passed away giving birth to my youngest sister, Kerstin. That was a really, really difficult time for our family, the hardest thing I've ever been through." 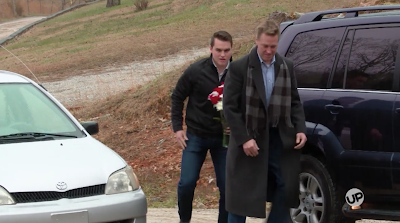 This evening on Bringing Up Bates, watch as Kelton Balka carries out his courtship proposal plan. The big day has an added layer of sentimentality because it involves doing something that brings back memories of his parents' marriage and his late mother. Watch the video below, and be sure to come back to the blog after the episode for my written recap and Fan File clip. I didn't know that. Poor kelton. How many siblings does he have? He said that there was 5 of them. (4 + himself). There’s also a photo in the video. (I don’t know if his Dad remarried and had more children). It says on the video that Kerstin is the fifth child. That's my exact thought. It's so tragic. Kelton is such a wonderful young man. I looked up the story about his Mother's passing and she died on the same day that my Mother died, only a different year. I was 17 so I know how hard it was for Kelton and his siblings... Their Mother would be so proud of all of them! I'm so happy that Kelton and Josie are together now. Such a lovely couple, God Bless! I have a friend who attends a program like me both of us has special needs but she has CP her mom died when she was a teen. She has 4 brothers and a half sister her grandma died last year to. Rip to Keltons mom she is in a good place heaven. This poor guy. You see, childbirth IS NOT always a walk in the park...I'm speaking to you, Bates and Duggars. Things happen in a second's notice. You need to be prepared and AT A LOCATION that has emergency equipment available on the spot. I hope this young man doesn't feel that he has to become a "Bates" because Kelly Jo is around. He seems like such a nice young man. I wish him, his father and his siblings the best and I wish them all 'new loves' in their own lives moving forward. Their mother seemed like a nice lady too. Annnd, they never said it was a walk in the park. They are very well aware of how difficult childbirth can be. Kelton is a fine young man, and seems to have a strong spirit that wouldn't be pushed around by every whim to be "someone else" that he doesn't want to be. Who knows, he just might find comfort in having a mother-in-law like Kelly Jo. Point well made! I would have lost my first son if it weren't for the quick action of a MD with the proper equipment to save his life in a hospital. My "full term /no issues" baby stayed in the hospital for a week after birth and is fine today. I agree with you, as someone who has experienced loss not every pregnancy results in a baby or a happy ending. I truly hope that when these 2 start a family they take that to heart. Children are a blessing, but having a mom there to raise you is also a blessing. I never would wish what I went through on anyone. I hope everyone has that happy ending, but reality is bad things do happen. #1, they’ve never said giving birth was a walk in the park. Like for real, no one thinks that. #2, we don’t know the circumstances of Kelton’s mother’s delivery, she could have been at a hospital, and had complications that even the doctors with all their magical staff couldn’t prevent. Many women die in hospitals every year from different complications. He has such a wonderful dad. God bless him and his family. Please stop saying things about the Bates not understandibg. If you don't know this then you don't need to be making comments about the dangers of home births. NOTHING in this article alluded to a home birth anywhere. If you don’t know this, then you don’t need to be making comments about how all the Bateses gave birth in a hospital or birth center. Kelly understands the risks birth brings to mother and child because of Addie's birth. Addie was born at home early and at a low weight. She had to be transferred to the hospital and EMTs saved her life along the way. IDK if the younger couples have used that experience as basis for why they go to hospitals or birth centers. However, it may have influenced their decision. Wow. That’s pretty mean and unfair. Both families have had their share of complications. Michelle had a micropreemie for goodness sake! And KJ had GBS complications with Addy and almost lost her. In a healthy pregnancy home delivery is perfectly safe. In fact they can be more safe because having a baby at home greatly reduces the risk of PP or infant infection. And if something looks like it will become emergent they will transfer to a hospital. Like with a handful of the Duggar girls. LMs are highly trained and know when to transfer. They hold a masters of science in midwifery. To pretend they aren’t qualified or that they women are endangering their children or themselves is ignorant. Honestly the ONLY delivery between the 2 families that seemed scary to me was Josh and Anna’s first baby because they had an unattended home birth. No medical provider. Just a doula/CBE. But even they they were fine. Also, Plenty of women give birth successfully in their late 30s. For the Bates and DUggars, they just had so many kids it increases the age related complications. Note Erin miscarried two or three times has a clotting disorder and she's just in her mid 20s. What is the best way to get the show if you don't have UP? I have bought them in iTunes and on amazon, but I see that I don't seem to get them all on iTunes, but it's harder to get them on amazon until later? Anon at 2:03PM: You seem to be assuming the Bates are just like the Duggars in preferring home birth. AFAIK none of the Bates have opted for home birth. I think only Alyssa was even attended by a midwife, the others have chosen to get prenatal care from OB doctors. Alyssa chose to give birth at a "birthing center" that looked very "homey" but that doesn't mean it didn't have medical equipment available. I guess it's possible Kelly Jo had some home births when she was younger, but I can't think of any Bates birthing at home since they've been on TV. The Bates always have their babies in the hospital. And home births can be safe if you have the right people there. Painfully hard to lose your Mom so young. She would be proud of her son as a solid young man. Kudos to his Dad and others who supported and guided Kelton growing up. He and Josie seem mature beyond their years and make a sweet couple. God Bless. Kelton is a fine young man. He and Josie make a nice couple. Wishing them all the best. So happy for Josie and Kelton. May all your dreams come true. God bless!!!! Congratulations to josey & kelten. Have a long and happily blessed life Together. And by the grace of God very healthy babies. The Bates are different than the Duggars. At least the girls go to college and have a career unlike the Duggar girls. Kelton is a fine young man. I find these comments sad, Kelly Jo, Michelle and none of the Bates or Duggar girls would intentionally do anything to put themselves or their babies at risk. I am sure they understand the benefits and risks of their options, and thought about them long and hard. It is so sad to me that people are ridiculing this family about home births when we don’t know the instance of Kelton’s mothers death. Regardless of what happened, it’s very sad.